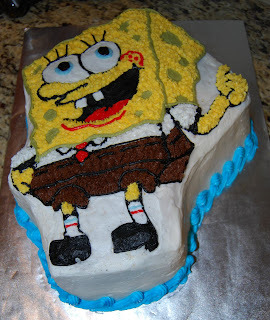 My neighbor's daughter is having a birthday party this afternoon, so I made her a SpongeBob SquarePants cake. Allie told me months ago what cake she wanted, so I hope she likes it! There is a LOT of detail work involved in these character cakes! Outlining and tracing and stars, oh my! Anyway, I do believe my favorite part of this cake is the bottom border. I came up with the idea of making waves at the last minute, and I think it turned out really cute. Don't you?